Start a return as normal. The transaction balance displays in parentheses, indicating that the store owes the customer money. 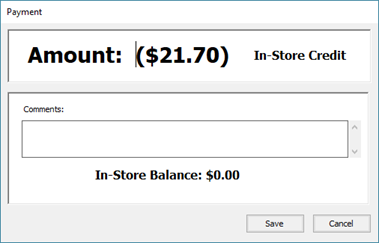 On the Payment toolbar, click In-Store. Amount is automatically entered with the negative transaction balance. Click Save. Complete the sale as normal. From the Ascend Desktop, click the Sale tile. Associate the customer who should have the credit. Do not add any products. Take the payment for the in-store credit (e.g. $50 in the Customer Satisfaction payment type). The transaction balance displays in parentheses, indicating that the store owes the customer money.